Drai’s Las Vegas Nightclub is a Las Vegas club that opened May 23rd, 2014 over Memorial Day weekend and cost $85 million to develop. It was designed by Victor Drai, and is operated by Drai’s Entertainment. Located on the 11th floor of the Cromwell Hotel, this 2 story venue with 90 foot ceilings features 65,000 square feet total with a 25,000 square foot indoor nightclub that utilizes a 35,000 square foot 360 degree outdoor panoramic roof top beach club in the evening. The total capacity is 4,700 with a 2,200 person limit on the inside main club, and a 2,500 person limit on the outside beach club. There are a total of 4 main bars, with 2 on the inside, and 2 on outside, 6 elevators, and 2 private VIP bathrooms. This venue is able to seat 1,400 people max, and there are a total of 150 VIP table locations, with 75 on the inside, and 75 on the outside. Drai’s Las Vegas Nightclub is the premier Las Vegas club for Hip Hop that forces you to walk down a set of stairs at the entrance that allowing you to oversee the nightclub & beach club since there is no wall barrier separation between them. There a number of VIP table locations in the main room including Dance Floor, Upper Dance Floor, Banquet, and Stage tables, as well as an Owners Suite. The Mezzanine level balcony has Elevated VIP Booths, and Mezzanine Booth Skyboxes. Where is Drai’s Las Vegas Nightclub located? The location of this Las Vegas club is on the 11th floor of the Cromwell Hotel, which is in the middle of the strip across the street from Caesars Palace. As soon as you enter the main door of the hotel and keep to the right. Look for the signs that guide you to any of the 6 elevators. When is Drai’s Las Vegas Nightclub open? Operational hours of this Las Vegas club are Tuesday, Thursday, Friday, Saturday, and Sunday from 10:00PM to 4:00AM. The beach club is open 10:00AM to 6:00PM daily during operational season, and reopens during the nightclubs hours on Tuesday, Thursday, Friday, Saturday, and Sunday. What type of music does Drai’s Las Vegas Nightclub play? Music genres in this Las Vegas club plays is primarily Hip Hop music, and features live hip hop performances. 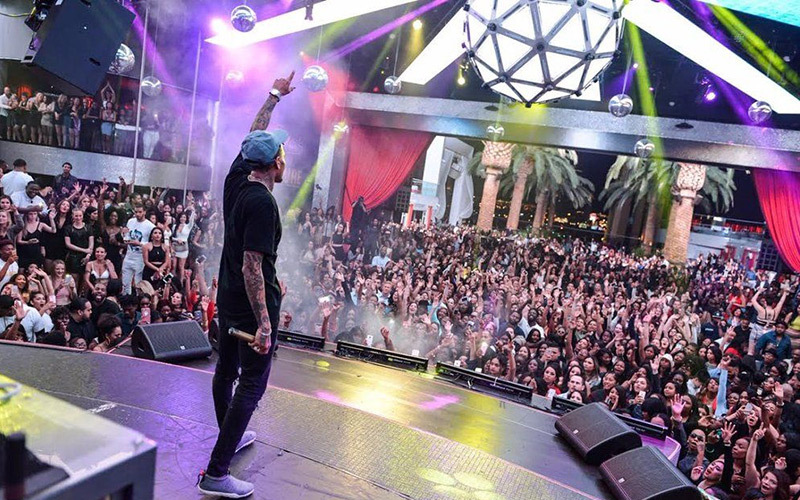 Drai’s is the # 1 nightclub in Las Vegas in 2016 for Hip Hop music. Electronic dance music is still played on a rare occasion. Who are the resident DJs at Drai’s Las Vegas Nightclub? 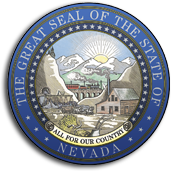 Resident DJs at this Las Vegas club in 2016 are are 4B, Bassjackers, Breathe Carolina, Brody Jenner, Devin Lucien, Dirtcaps, Dr. Frescha, Ghastly, Gusto, Helena, Kimkat, LA Leakers, Makj, Miju, Morgan Page, Ookay, Party favor, Quintino, Snbrn, Savi, Sour Milk, Wax Motif, and Zeds Dead. The 2016 live performance residents include 50 Cent, Big Sean, Chris Brown, Dj Esco, Future, G Easy, Jeremih, Nelly, Pusha T, T.I., Trey Songz, and Waka Flocka Flame. The 2015 DJ residency lineup consisted of 12th Planet, 3LAU, Adventure Club, Arty, Borgeous, DJ Irie, DJ Shift, Kap Slap, Lucky Date, Showtek, Quintino, Sidney Samson, and Starkillers. How much is cover charge at Drai’s Las Vegas Nightclub? Cover charge at this Las Vegas club is estimated to cost $35.00 for ladies and a $50.00 for men during regular events on Thursday. During weekends and special events, the cover charge is about $60.00 for ladies and about $90.00 for men. You can expect prices to rise as high as $115 for ladies and $190.00 for men during special events over holidays. Purchasing presale tickets may entitle you to a better price than what you pay at the door if offered. The list may entitle you to reduced admission. How long is the line wait at Drai’s Las Vegas Nightclub? Line waiting times at this Las Vegas club can take anywhere from 10 minutes to 1 ½ hours depending on the day of the week and the line you are standing in. Thursdays tend to take about 20 to 40 minutes. On Fridays and Saturdays it takes about 40 minutes to 1 ½ hrs. During special events on holiday expect to wait 1 ½ to 2 hours in line. The guest list line is located on the left of the entrance will move faster than the general admission line, but moves at about the same speed as the presale ticket line. The fastest line to be standing in is the line for bottle service reservations. What is the dress code at Drai’s Las Vegas Nightclub? Dress code at this Las Vegas club is enforced and is very strict, so do not expect to get in if you are wearing any type of athletic sportswear. Excessively baggy clothing, ripped pants, ripped shirts, hats, jerseys or athletic shoes are not permitted entry. Just because the club plays hip hop music does not mean they are going to be lenient with hip hop attire. It’s Las Vegas, so dress to impress. We suggest that you wear nice shoes, a collared shirt, dress pants, and belt to ensure no issues arise at the door. Ladies should avoid wearing flip flops or sandals during nightclub operational hours. 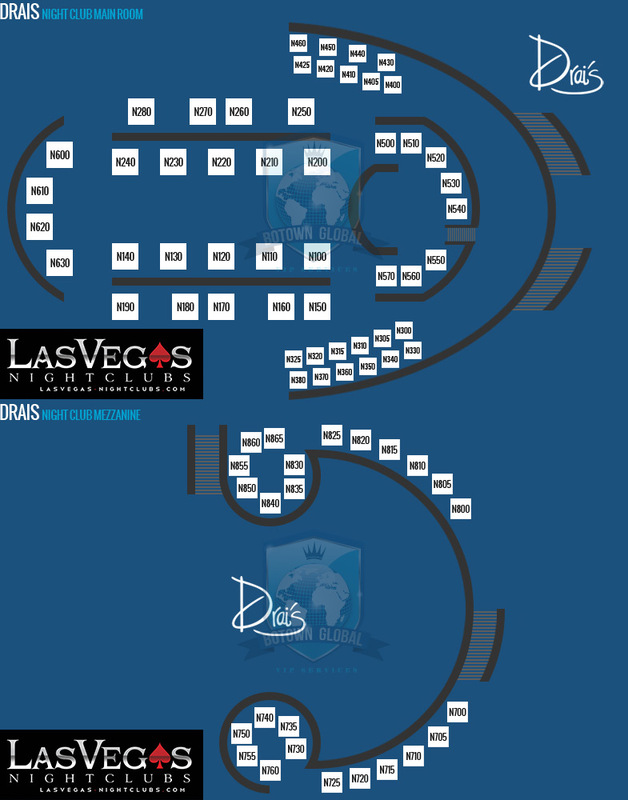 What are the Main Room VIP table locations at Drai’s Las Vegas Nightclub? The Main Room in this Las Vegas club has 14 “Dance Floor” tables that seat up to 14 people, and surround the dance floor on all 3 sides. There are 8 “Upper Dance” Floor tables that seat up to 14 people with 3 on the North Side, and 5 on the South Side of the room, that are right behind the “Dance Floor” tables. The “Owners Table” seats up to 14 people, and is connected to the Upper Dance” Floor table on the North Side that is closest to the stage. There are 9 Banquet tables that seat up to 6 people. There are 10 Elevated VIP Booths that seat up to 10 people with 4 on the North Side and 6 on the South Side of the Main Room. There are 10 Banquet tables the seat up to 6 people, with 4 on the North Side, and 6 on South Side of the Main Room that are directly in front of the Elevated VIP Booths. You can enjoy the view from any of the 8 Stage Tables that seat up to 8 people, and wrap around behind the DJ booth. Most of the VIP table locations have black faux crocodile markings on the furniture. What are the Mezzanine Level VIP table locations at Drai’s Las Vegas Nightclub? In main room of this Las Vegas club has a Mezzanine Level Balcony that has 12 Mezzanine Booth Skyboxes that seat up to 10 people, with 6 on the North Side, and 6 on the South Side of the 180 degree split offering a birds eye view over the dance floor. There are 12 VIP Balcony Tables that seat up to 6 people, with 6 in the North Side Lunar Suite, and 6 in the South Side Lunar Suite on the Mezzanine Level Balcony. What is the Ceiling Centerpiece Octacontagon at Drai’s Las Vegas Nightclub? This Las Vegas club has a 1,700lb Ceiling Centerpiece Octacontagon that is 8 feet in diameter, and resembles a giant disco ball that dangles over the center of the main room dance floor. It is constructed with 80 facets, and 80 triangular 10mm SMD LED video tile panels. There are 120 12-inch RGB LED Philips Color Kinetics iCove QLX LED strip lights that create an illuminated outline on the perimeter of each of the triangular video tiles. There are 42 Eurolite LED pinspots that are connected to each of intersecting points on the video tile panels. The Ceiling Centerpiece Octacontagon is layered onto 8 Elation Platinum Beam 5R Extremes in the space between the spokes, while incorporating Rayzor Q12 wash lights, and LED Protron strobes. There are 12 Elation Professional Platinum Beam 5R Extremes on an individual platform this behind the Centerpiece Octacontagon. There are 12 Radiant LED video screens above the Centerpiece Octacontagon that range from 29 inches to 48 inches that attach to the panoramic video screens. The Centerpiece Octacontagon is 8 feet in diameter incorporating a metal frame, and is able transform its appearance, and can either be raised or lowered. 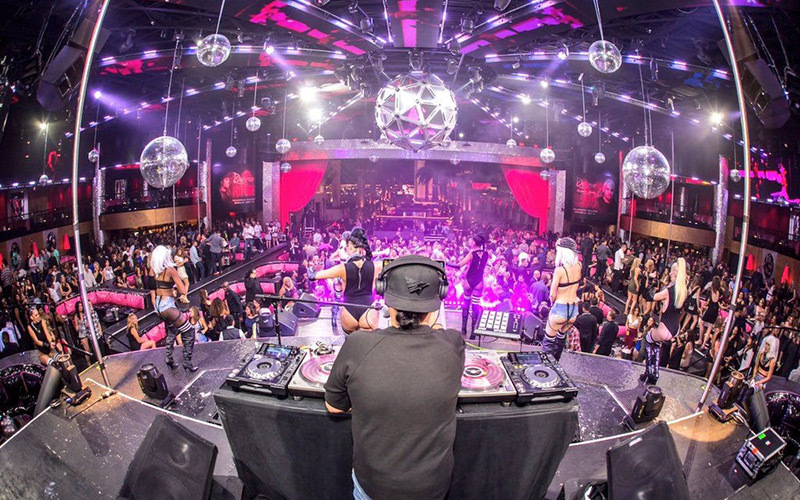 What kind of DJ booth setup and equipment does Drai’s Las Vegas Nightclub have? The Dj booth in this Las Vegas club contains a 2 tier setup with a 30 foot framed rectangular arch that features the DJ console on the lower tier, and the Lighting and VJ operators on the upper tier. The DJ console has sound console that pushes the output from the microphones and the DJ Mixer. The DJ booth is fastened to video screens in the front, and has incorporated 5 Funktion-One (Bass Reflex Range) BR221 2x 21″ driver subwoofers. There are 2 Funktion One F315 speakers with 15 inch triple mid bass drivers on top of the Funktion One BR221 subwoofers. The DJ booth equipment features 6 Pioneer CDJ 2000’s, Pioneer DJM 900 mixer, Pioneer DJM 1000 mixer, a Yamaha LS9 mixer, and 2 Allen & Heath mixers. Last but not least the DJ booth has confetti cannons, hazers, and CO2 machines. 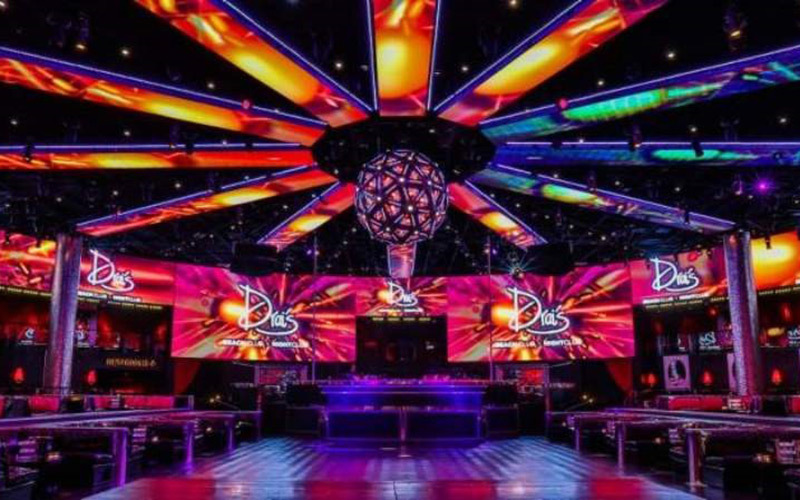 What type of Lighting does Drai’s LasVegas Nightclub have? 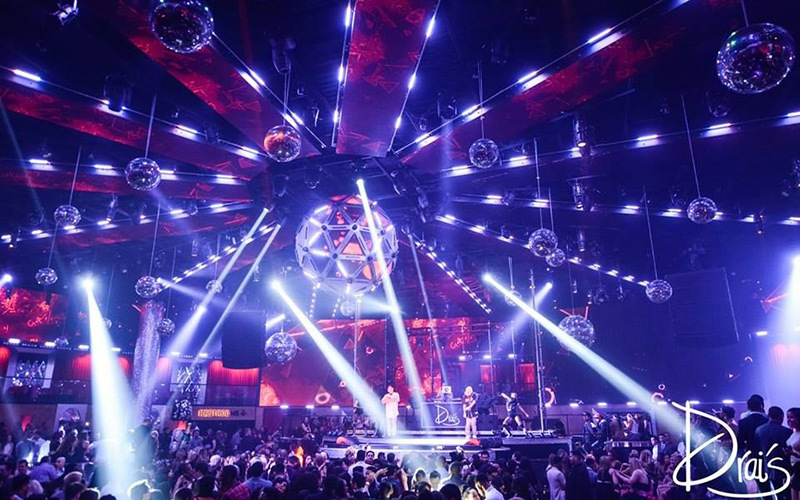 Lighting in this Las Vegas club took almost 6 months to construct the mapping of the theatrical and architectural lighting design that would work properly with the club’s infrastructure and geometry. There is more than 7,000 square feet of LEDs, and contains more than 4,000 square feet of wrap around HD LED inside of the main club. The design required multiple layering of spots, beams, and washes that were tested individually to make sure things were set up properly, and do not make use of any trusses for support. Eurolite LED pinspots, Elation beam washes, and over 1000 Cove fixtures were evenly distributed when installed, and some of the fixtures were set up in mirror image arrays. The eW Cove EC Powercore Philips Color Kinetics were used to frame the LED video display. The Mezzanine Balcony level features Elation Protron LED strobes, Elation Cuepix Strip WW bar luminaires, Lasertainment RGB laser projectors. Drais Las Vegas Nightclub is a Las Vegas club that predominately uses Elation Professional Lighting as their preferred brand. The Elation Protron LED strobes control the chase effects, strobe intensity, duration, and rate. There are Elation Platinum Beam 5R Extreme moving heads have quick speeds, frost effects, and an 8 facet rotating prism. The Elation Platinum Spot 5R Pro features CMY color mixing, tilt locking, and has a built in Elation DMX receiver. The Elation Q12 Zoom LED wash lights have 12 RGBW LEDs with pixel zone control, chase effects, strobes, and dimming. Each of the Elation Cuepix Strip WW bar luminaires contain 5 COB LEDs that are operated separately, and contain individual pixel control, strobes, chase zone effects, and a variety of dimming curves. There ETC Source Four ellipsoidal fixtures that push 375 watt lamps, and last but not least, 4 Lasertainment’s RGB laser projectors that built into the wall soffits, and are used for aerial beam effects. All of the lighting is controlled by MA Lighting grandMA2 consoles. What type of Audio does Drai’s Las Vegas Nightclub have? Audio design at this Las Vegas club was developed by Sound Investment Audio out of Chicago that creates custom sound, video, lighting, and digital processor systems. Funktion One audio equipment is used because of the directional control of sound that it offers. The audio system pushes 160,000 watts, and has been multi layered, as well as strategically placed in the corners of the main room where the Funktion One speakers point towards the center of the dance floor, and VIP table locations. The architectural infrastructure and geometric layout of the main room is what determines where the locations of the speakers are positioned. What type of Video does Drai’s Las Vegas Nightclub have? Video design at this Las Vegas club has more than 7,000 square feet of LED video screens throughout the entire venue, and about 3,244 square feet of LED Video screen s are inside the main club. The LED screens come in 25 different sizes. The main room has installed 12 LED video tile panels with high resolution on the ceiling that that vary in size from about 30 feet to 48 feet in length and contain Philips iColor Coves in the center of the video tile panels. There are over 410 video tiles from AG Light and Sound on the interior walls including 328 video tiles that are 7mm, and 85 that are 12mm. There are 68 by 7 square foot LED video screens attached to the porte-cochère, and behind the DJ booth is a 1,785 square foot, 270 degree 7mm wraparound LED video wall screen. VSquared Labs out of Los Angeles, California custom built and implemented (2) 3D Epic mapping severs with 8 DVI output, that and contain over 900 sample clips that can be manipulated. 1 of the Epic servers was used as a backup for safety. There are also 8 DVI outputs total. Learn about the Drai's guestlist. Dimly lit late-night party spot with luxe leather seating & private tables in swanky surrounds inside The Cromwell.